Shankar Vendatum at Slate gets his Greek wrong and tries to explain a paradox that does not exist. To whit - Why polls show that Americans distrust Republicans more the Democrats, but are going to vote for Republicans over Democrats in the mid-terms anyway. Along the way, he touches on a subject near and dear to my heart. 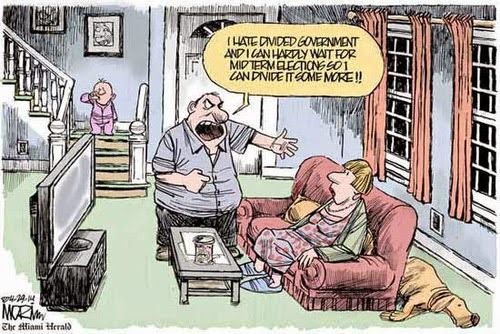 "One explanation for our paradox is that Americans want divided government. If we have gridlock with one party in charge, perhaps we would have more legislative movement if power in Congress were divided? This might make sense as a national storyline, but it doesn't make sense in the real world, because wanting divided government doesn't tell an individual how to vote. If you are a voter in, say Pennsylvania's 8th District, would you vote against Democratic incumbent Patrick Murphy in order to get divided government if you weren't sure how people in all the other congressional Districts were going to vote? If you liked Murphy, would you say you are going to vote against him just to get divided government? For one thing, if people in other districts voted against Democrats, you could get divided government even if you voted for Murphy. Wouldn't it make more sense to stop worrying about how everyone else votes and simply pick the candidate you like?" First, you have to understand the definition of divided government in the context of the US Federal government. 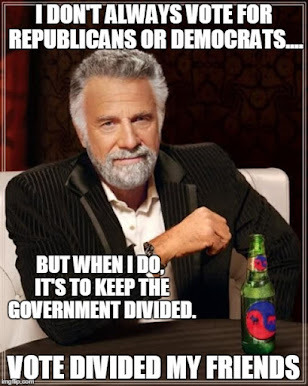 The political science definition of Divided Government in this context simply means one party does not control the executive branch and majorities in both legislative branches. Second, you need to understand the reasons why you want a divided government end state. I outlined my reasons in the post Voting By Objectives. Your mileage may vary. Third, you need to appreciate that you are in a sliver of a minority of the electorate, and you are voting to achieve the end state of divided government, not by splitting your vote, but by voting in the manner that is most likely to achieve that divided government end state. Finally, by taking a clear eyed look at that current partisan pre-election state of the executive and legislative branches, the divided government vote will almost always be completely obvious. You win some, you lose some, and there will be circumstances where there is no specific divided government vote, such as in 1998. If the divided government vote is not obvious, if reasonable people can argue about what the correct "divided government" vote should be, then it is likely there simply is no "divided government" vote for that election. In that circumstance, the moderate/libertarian/independent/dividist voting block (should one ever come into existence) would go "free agent." I hope that helps Shankar. Let me know if you have any questions. I’m not saying that preference for divided government explains all or, necessarily, even most of the anticipated vote swing in 2010. But don’t be so quick to dismiss the idea. What disturbs me in Vedantam’s otherwise interesting article is the oh-so-quick move to explain away uncomfortable political trends with psychological explanations. Whether the argument is that whites voted for Obama because it made them feel good about themselves, or that people are planning to vote Republican in 2010 because “our unconscious bias favors action over holding steady, regardless of whether that makes sense,” my response is: Maybe so. But let’s consider some more direct explanations first." Occam's razor informs us that the simplest explanation is often the best explanation. 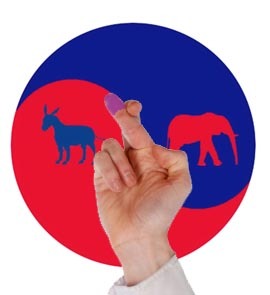 Preference for divided government can indeed swing votes. It definitely swings this vote.